Thanks to Peggy Renk for caption help on this page. Frank Waller in his "Charles Chips" uniform, Lynn Baden standing with her pink jacket. In the left background, Michael Molisani in vest and blue shirt; right background, Liz Mortensen in black, and Greg Bilan behind Lynn. 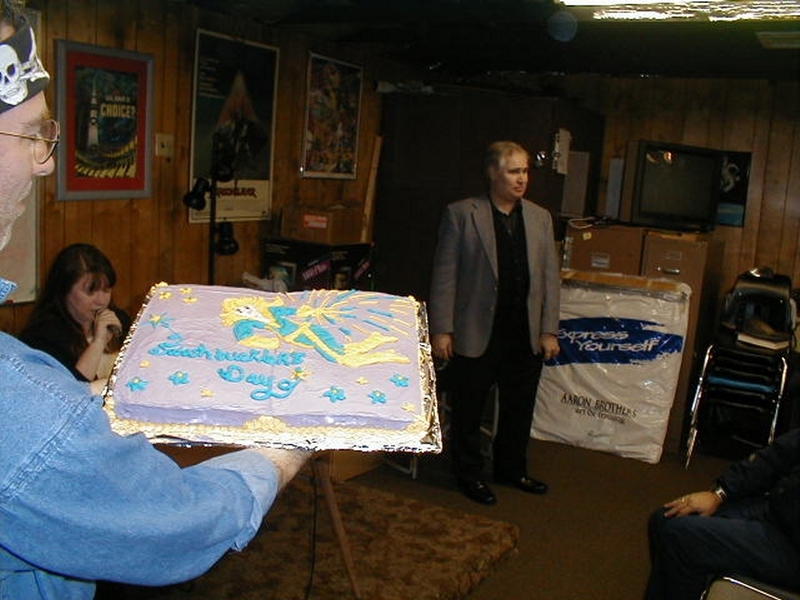 Someone holds up the "Swashbuckler's Day" cake that Peggy made. Charles Lee Jackson II in the background. Pat Lawrence with her mug of holding. Somebody's arm, and Cathy Beckstead and a healthy meal of stuffed potato skins. Behind her: someone (Mike?) in a striped shirt, and Eric Pobirs. Cathy Beckstead and Liz Mortensen. Behind them in the booth: Hal O'Brien. Chaz Boston Baden's profile and arm, Christian B. McGuire with a lemon (and a lemon cake in front of him), Steffnee Peterman looking over his shoulder, and Kris Bauer watching all of us. Steffnee Peterman and Kris Bauer, with their hands on their chins. Christian B. McGuire in foreground left.